The top picture shows ELB 796 undergoing trials under the wires at King's Cross shortly before the changeover from trams to trolleybuses. 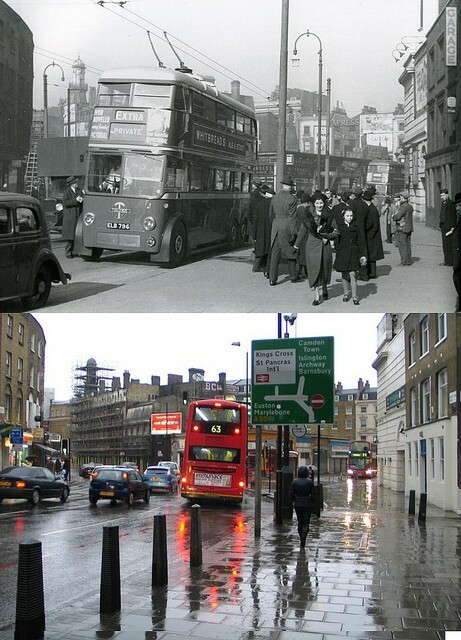 The buses in the far distance in both pictures are parked on King's Cross bridge in roughly the same location in both pictures. Much of this part of London still retains it's Victorian and early 20th century buildings, partly because of the terrible reputation associated with this area from the 70's to the naughties. There are no modern buildings at all and although, in the bottom picture, the lighthouse building and all its neighbours are swathed in scaffolding, it is to be hoped that this is for renovation rather than demolition. Recommended web site to visit: Warsaw1948's photo stream in Flickr. The AMTUIR is responsible for a collection of over one hundred and fifty vintage vehicles. They are maintained and repaired for public display and to provide income through their hire for special events. Tramcars are actively being restored with the eventual aim of having a historic streetcar line. Maybe in the more distant future there could be overhead wiring for trolleybus operation. The museum has always been known among enthusiasts as the 'home' of the preserved London trolleybus, with No's 260, 1201 and 1521 in residence and now 796 is back in the UK under a loan agreement between the London Trolleybus Preservation Society and The Paris Transport Museum. You can take an historic journey on any of these trolleybuses from the Museum's Chapel Road Terminus travelling over various parts of the custom built road network. The museum has brought together relevant items of street furniture that includes post boxes, phone kiosks and street lamps to show the vehicles operating in an environment that is both interesting and appropriate. An approach was made by the London Trolleybus Preservation Society to repatriate 796 and it returned to England on the 6th October 2010 and following restoration, now operates at the East Anglia Transport Museum. A rationalisation of AMTUIR's vehicles led to them offering 488 to the EATMS. This was accepted and with the help of a bequest from Peter Mitchell, transportation of the tram to England and its full restoration was possible. 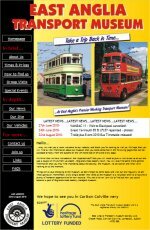 The 488 web site has been created with the intention of following restoration progress and to provide background information on the life and times of the tram during its long working career. The Ffestiniog Railway will carry out restoration work and have already taken delivery of the lower half of the tram. The upper deck will follow in due course. A full review expected by 15th August. After four years of research, acquisition and compiling, collaborators Ashley Bruce and Gottfried Kure have produced a near definitive work on the obscure and yet surprisingly nostalgic subject of the Trolleybus in miniature. 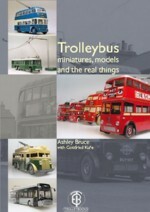 The result is an encyclopedia of the world's trolleybuses through the ages, seen as they once were and how they now exist in miniature. Printed in full colour, with 416 pages and over 1532 photographs, diagrams and illustrations. 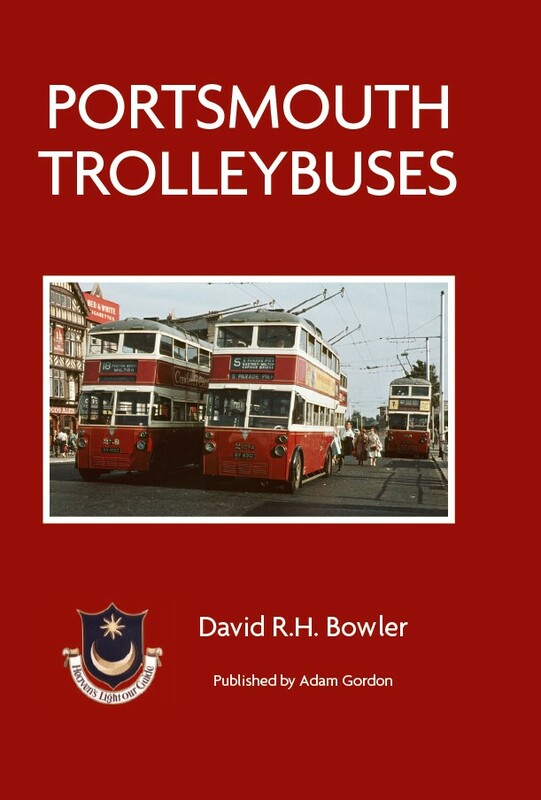 This latest definitive trolleybus system history from the pen of David Bowler, author of the Bournemouth and Nottingham histories, features the UK's only island city - well-known to anyone who served in the Royal Navy or holidayed in Southsea. 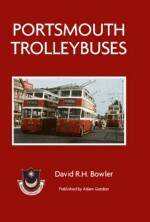 Commencing with a brief introduction to the tramway system the book charts the developments of the trolleybus in Portsmouth from the first unfruitful council discussions, to the initial experimental route, the tram to trolleybus conversion programme, the city's baptism by fire in the Second Word War, the post-war recovery and heyday's, through to the rundown of operations in the early 1960s and closure in 1963. The book is accompanied by 17 appendices covering everything from the vehicles to power supply, and some 50 maps or plans. 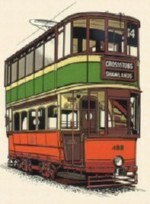 The many mono and colour photographs show both the vehicles in detail and show how the trolleybuses were an integral part of the "Pompey" scene for almost 29 years. 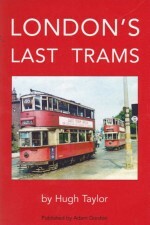 If you are interested in British trolleybuses this book belongs in your personal library. Payment by cheque or through the Paypal system.